Eurocopter has conducted the first flight of its no. 1 series-production EC175, and confirmed the performance of this next-generation multi-role helicopter. 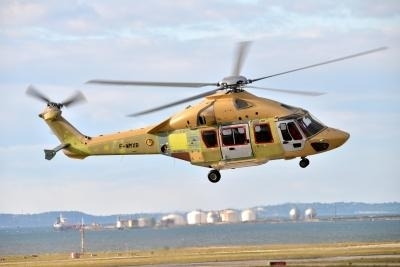 The maiden flight occurred last week at Eurocopter’s Marignane, France headquarters facility, with company pilot Augustin Dupuis at the controls. Eurocopter announced performance figures for the aircraft Wednesday which are better than the helo's original estimates. Its recommended cruise speed is 150 kts. – 10 kts. faster than the previous figure without affecting payload range – while the maximum cruise speed exceeds 165 kts. Eurocopter’s program flight tests to date also have confirmed the EC175’s power performance, including hover out of ground effect (HOGE) at maximum take-off weight at 4,500 ft. at ISA+20°C conditions; excellent one engine inoperative (OEI) hover performance, which ensures safety during hosting for search and rescue missions ; extensive power reserve and heli-deck performance (PC1) at maximum take-off weight in ISA+20°C conditions –available with application of the latest certified version of Pratt & Whitney Canada’s PT6C-67E engines. The EC175 avionics extends the EC225’s undisputed superiority of in-flight envelope protection, pilot assistance and situational awareness and includes the most innovative alerting and self-monitoring system. “Helionix,” the newest avionics family being certified, meets the latest international avionics standards, and makes the EC175 the second aircraft to apply them – after the Airbus A380. The first EC175 version to receive airworthiness certification will be for the highly-demanding oil and gas market. With the designed-in attributes that meet rigorous operating conditions for off-shore missions – along with its range and speed – the EC175 is the best choice to address all missions, including search and rescue, emergency medical services, public services, VIP and executive transport.